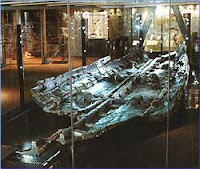 In spite of its prosaic name, the Dover Bronze Age Boat is the most interesting ancient boat I've ever seen. And I do mean "seen", for I had the immense pleasure of seeing it while it was at the bottom of a 6-meter deep excavation, with road construction work going on all around it in Dover, England, in 1992. My wife and I had moved to London, more of less for the adventure, and at the time I was attempting to earn a living as a freelance writer, concentrating on work for the public relations industry -- which work never materialized. But when I heard about this archaeological find, I ran down to Dover, talked my way into the pit, took a bunch of photos and spoke to a number of the key individuals involved (including Valerie Fenwick and Peter Marsden) before anyone realized that I shouldn't have been there at all. I did sell a short article to the Times of London, and there I let it sit for quite some time. Recently, I've been reading The Dover Bronze Age Boat , edited by Peter Clark (English Heritage, 2004). This is an expensive collection of scholarly papers and not intended for the general public, so it's hard going, but fascinating nonetheless. Many of the earliest assumptions about the boat have been supported, while others have been substantially revised over the years. After the artifact was recovered and conserved, it was put on display in the Dover Museum (picture above courtesy of the museum). Additionally, a team of woodworkers skilled in the use of hand tools reconstructed a 3-meter long replica of the boat's mid-section, using replicas of period bronze tools, to collect new data and test a number of hypotheses about the construction methods. Built around 1,500 BC, the boat is at a juncture between dugout and plank-on-frame technology. The four large planks that were recovered were heavily and elaborately carved, in some ways reminiscent of dugout procedures, but then they were assembled to make a boat larger than any single-tree dugout could have been. The two bottom planks were mainly wedged together, but there are a few transverse members that run through massive cleats that were left standing proud when the bottom planks were carved, and these represent an extremely early manifestation of the modern function of planks, but one that was ultimately a dead end. The next planks outboard of the bottom planks, called iles, describe roughly 1/4-round, hollow sections, making the boat flat-bottomed and round-chined. The iles were "stitched" to the outer edges of the bottom planks with yew withies -- i.e., thin shoots or branches -- that were twisted to be made more flexible, then probably soaked in water, and then pulled through mating holes in the iles and the bottom planks three or four times each. The stitches were tightened up by forcing long, thin laths beneath them on the inside of the boat, and moss was placed under the laths as a caulking material. The rabbeted top edge of each ile, and the stitch holes that appear there as well, indicate that the hull was at least one plank taller (and probably no more than one). Neither of the top side planks survived, however, and it is believed that they were purposely removed by the boat's owners, who may have "retired" the boat ceremonially by thus partially disassembling it. One end of the boat was recovered, but this is missing a more critical part: the end-plank, which appears to have been a kind of scow-bow configuration. The ends of the bottom planks feature the most impressive, and convoluted, carved features, with rails that form a kind of swallow-tail or V-shaped section, to which the end plank was fastened with wedges. (The iles, and probably the upper side planks, were evidently stitched to the side edges of the end plank.) I'm not aware that a more rounded front end, dugout-style, might have been considered and rejected, but the scow bow certainly seems feasible. Due to scheduling needs of the transportation authority and the company managing the construction of the highway, it wasn't possible to extend the excavation to attempt to recover the boat's other end. This is an awful shame, since we don't know how long the boat was; don't know how the other end was closed in; and in fact don't know for certain that the end that was recovered was in fact the bow. If I had a few million dollars lying around, I'd try to mount a rescue of the missing pieces. Did Indians of New England go whaling?